CATHOLIC BISHOPS in Germany have announced plans to effectively excommunicate believers who refuse to pay the country’s controversial church tax. The “general decree”, effective from September 24th, excludes non-payers from Communion, Confirmation and Confession or belonging to a Catholic congregation. Catholic funerals will also not be possible “if the person who has left the church has not shown any sign of remorse before death”. The church says non-payment violates an obligation on its members to make a “financial contribution that allows the church to fulfil its role”. Germany’s church tax has its origins as compensation for church property seized by state authorities in the early 19th century. Two centuries on, the tax, calculated as up to 8 per cent of income tax, raises approximately €5 billion annually for the Catholic Church; the Lutheran church receives €4 billion. It is collected by the state tax authorities and forwarded on to churches for a handling fee. Anyone unwilling to pay can fill in a form at a state office. German bishops interpret this as a conscious break with the church but the Vatican said this step was not evidence of a clear “schism” and grounds for excommunication. In a compromise with the Vatican, bishops will ask priests to write to anyone planning to leave, warning of the consequences and inviting them to meet. At dinner my family was discussing this and the word simony kept popping up. Father Antonio José Martinez (1793-1867) of Taos, New Mexico, was himself a wealthy man, but when Mexico became independent he was instrumental in abolishing compulsory tithes because he thought they hurt the poor and led to alienation from the Church. Martinez paid for most of the expenses of the local church out of his own pocket. When Lamy became Archbishop of Santa Fe, he wanted his tithes and denied the sacraments to anyone who did not pay the tithe. Lamy planned a bureaucracy and a school system and needed money to pay for them. Martinez protested and this controversy was one of the major sources of the fight between Martinez and Lamy. 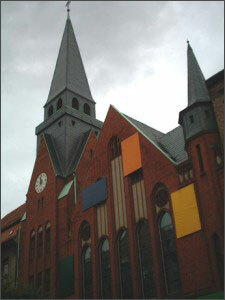 After the Napoleonic Wars, church properties were confiscated by the German state, the Catholic Church in Germany received in recompense the Church Tax. 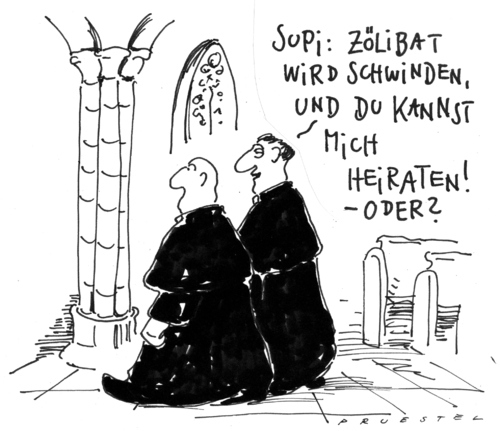 All Catholics who are officially registered with the state as Catholics must pay a small percentage of their income as the Church Tax, Kirchensteuer. Post-war prosperity swelled the coffers of the Church ( a tax of $11 Billion in 2010) and enabled it to construct an immense bureaucracy. When Ratzinger went to the Vatican he marveled that it has fewer employees than the archdiocese of Munich. There is only one way not to pay the tax. Catholics can go to a state office and declare that they are no longer members of the Catholic Church and therefore are not subject to the Church tax. Many did this during the 1930s under Nazi pressure. Recently the numbers of those leaving the Church have swelled. Some have lost faith, others don’t want to pay the tax, others are unhappy because of the sexual abuse scandals in Germany. Fewer Catholics paying Church tax = less money = CRISIS. Frankfurter Allgemeine Zeitung reports that the German bishops have taken a strong stand. May be denied Catholic funeral rites and burial. Some Germans claimed when could fulfill the obligation to support the Church financially without paying the Church tax, but Benedict XVI and Cardinal Gerhard Müller, the head of the Congregation for the Doctrine of the Faith, have approved the German bishops’ decree and given it the force of canon law. On Tuesday, though, the German Federal Statistical Office released preliminary figures for all of 2008, and the news is not pretty. Rather than the heralded rise in births, 2008 saw a 1.1 percent drop in the birthrate — or 8,000 fewer children for a country already worried about its growing demographic crisis. Allan Carlsson has observed that it is not possible for a government to buy children. At best government policies can encourage people to have children earlier, but polices will not increase the number of children. Sectors of Germany, right and left, want to encourage women to enter and to stay in the work force. The number of working-age Germans is dropping rapidly. Business wants a larger work force to keep down wage demands, and therefore wants women in the work force. Egalitarians who want men and women to have identical life-patterns therefore want women in the work force. But it is hard to have a replacement birthrate when women have the pressure of a career. Allan Carlson has emphasized that a government can’t buy a higher birthrate. Generous family allowances may encourage couples to have their children earlier in life, but the ultimate birthrate is not affected. A drop in the number of births in Germany during the months of October and November suggests there may have been a birth rate decline in the country during 2008, despite lavish government benefits for new parents. For months, it looked like Germany might have put a stop to its shrinking birth rate. Indeed, in 2007, the country actually managed a bit of population growth. And, with a fast graying population that will be knocking on the door of the local pension office in the next few decades, it was high time, too. But a reversal of Germany’s demographic fortunes has proven to be a mirage. Birth rates reflect confidence in the future, and ultimately some sort of faith in Providence. Economic hard times will further de[press the birth rate and increase the burden of pensions, which in turn will lower the income of workers, leading to a lower birth rate, and so on. Euthanasia or massive immigration are the obvious solutions; Holland has already adopted the former to control health care costs. Police in the western German city of Duisburg have admitted they removed flags a student had hung in his apartment in support of Israel during a pro-Palestinian protest march in the city. Officers broke down his door and removed the flags. The city’s police chief has issued an apology, but outrage is spreading. A student had hung Israel flags in his apartment window. He was outside watching the anti-Israeli demonstration. “Suddenly,” the student explained, “I saw a police officer on the balcony on the second floor” in the apartment located directly beneath his. The officer ripped down the Israeli flag that had been affixed to P.’s balcony. A short time later he witnessed an officer inside his own apartment taking down the flag that had been hung in the bedroom. To see the Moslem youths applauding the police tearing down the Israeli flag see YouTube. And the student is afraid to use his apartment, because the police destroyed the door. On Tuesday, Peter P. said he had obtained the services of a lawyer. He still hasn’t been told who will be held responsible for paying for the door broken down by police. A small rehearsal for a future Kristallnacht? Italian socialists want to identify all Jewish-owned shops so people can boycott them. The Germans perhaps can supply old Stars of David from war surplus. is now a children’s museum. but the interior, the clients insist, will be by a Turkish firm that specializes in Islamic kitsch. The Germans are not happy about it, but they are neither having children nor going to church, so all they can do is complain. The Germans are having to face the consequences of their failure to have children. 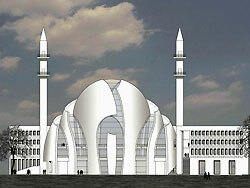 The Frankfurter Allgemeine Zeitung reports that massive numbers of apartemts have to be demolished. There are now 82 million people living in Germany; by 2050 there will be only 70 million. Even by 2020 there will be 350,000 fewer households, and therefore a need for 350,000 fewer apartments. The population decline is masked because some cities, like Munich, are still growing. The eastern and northern regions of Germany are emptying out.